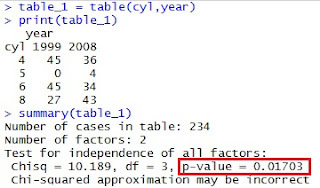 In our last blog, we have covered "How to get Basic Statistics in R", let's now go ahead and learn process of frequency analysis in R and also the Chi-Square test. The tutorial is quite useful, especially, when you perform a Logistic Regression. For the purpose of this analysis we would be using an inbuilt data of R "mpg". and you get the result like this >>>>>>>>>>>>>>>>>>. So, it takes the first argument in the "table" function as "Row Labels" and second one as "Column Label" and then gives frequency. You can notice that in first result, the summation of proportion across rows are 1 and in the second one summation of proportions across columns is 1. In third one, the summation of all the proportions in the matrix is 1. The frequency analysis is not limited for 2 variables at a time, you can go n-way. There is one more function "xtabs", that can be used to doing same. Last thing in the Frequency Analysis, that we need to learn is "How to perform a Chi-Square Test ?". 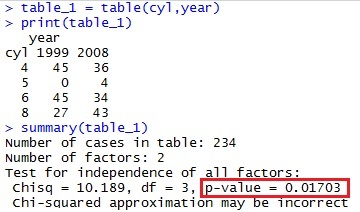 we can see that p value is less than generally accepted cut-off 0.05 and hence we can reject the Null Hypothesis of independence of variables year and cyl. Here we fail to reject the Null Hypothesis and can say that variables are independent.